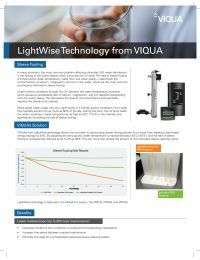 Viqua PRO systems have evolved significantly since becoming the very first UV product certified to NSF Standard 55 Class A. Our latest upgrade kit, which features our new LightWise Technology, provides the most advanced enhancements in UV disinfection with the equipment you already own. 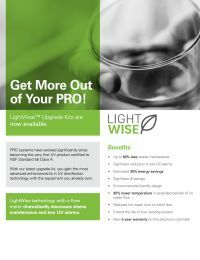 LightWise technology with a flow meter dramatically decreases sleeve maintenance and low UV alarms, extending the life of your equipment at a fraction of buying new. The controller reduces lamp power during periods of no water flow, leading to a reduced rate of sleeve fouling and maintenance, as well as a variety of other benefits. This kit is compatible with Viqua PRO10 UV systems that do not already feature LightWise technology, and is not compatible with any other UV system.Includes: Flow-Meter: The flow-meter converts flow rate readings to a 4-20mA signal, which in conjunction with the UV sensor’s 4-20mA signal, is used to calculate the actual real-time UV dose. LightWise Technology TM Controller: Allows the electronic control system to lower the power during periods of no water flow, leading to energy savings. This technology allows for a substantial reduction in sleeve fouling.